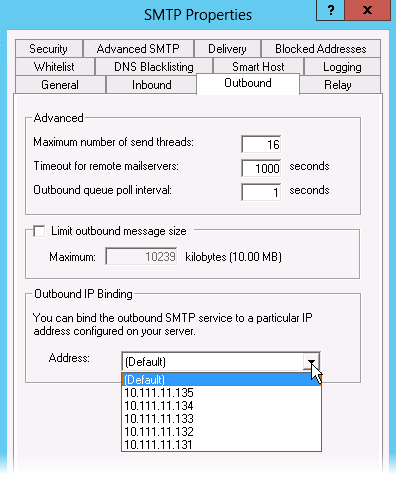 How to set up default Outbound IP address for MailEnable? Note: by default, MailEnable uses IPv6 if it is available in the server, therefore it may be required to disable IPv6 manually. To disable it connect to the server via RDP, and modify Windows registry. Open branch "HKEY_LOCAL_MACHINE\SOFTWARE\Mail Enable\Mail Enable\Connectors\SMTP", set parameter "IPv6 Status Value" to value "0. For details check MailEnable forum tread. Open Mailenable Administrator by either running mailenable.msc (with Start > Run ) or by finding MailEnable in the Programs section of the start menu (or start screen on Windows 2012). Go to MailEnable Management > Servers > localhost > Connectors . Right-click on SMTP and choose Properties . By default the first adapter/interface added to the computer is always used for outbound traffic. Right-click on SMTP > Stop and then SMTP > Start.